A field-programmable gate array means Krtkl's Snickerdoodle can tackle complex projects, like robots or drones, unlike the locked-down Raspberry Pi. The $35 Raspberry Pi mini-PC serves as a cheap, yet damn fine introduction to both computer programming and the joys of what’s become known as “making”—using cheap, sensor-laden computer boards to power devices that interact with the world. 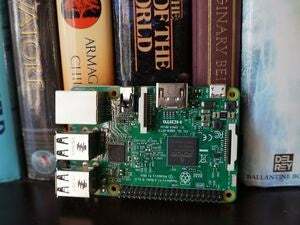 Makers can create some amazing projects with the Pi, but the limited number of general-purpose input/output (GPIO) pins on it hinders the creation of truly complex projects. 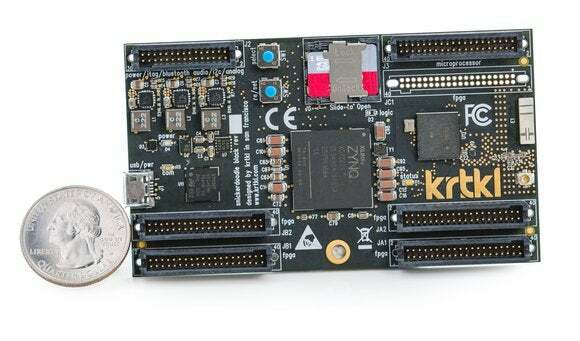 Enter krktl’s more maker-friendly Snickerdoodle, a $55 board that aims to become the Raspberry Pi for robots by bringing flexible, pro-level hardware to the masses via a crowdfunding campaign. 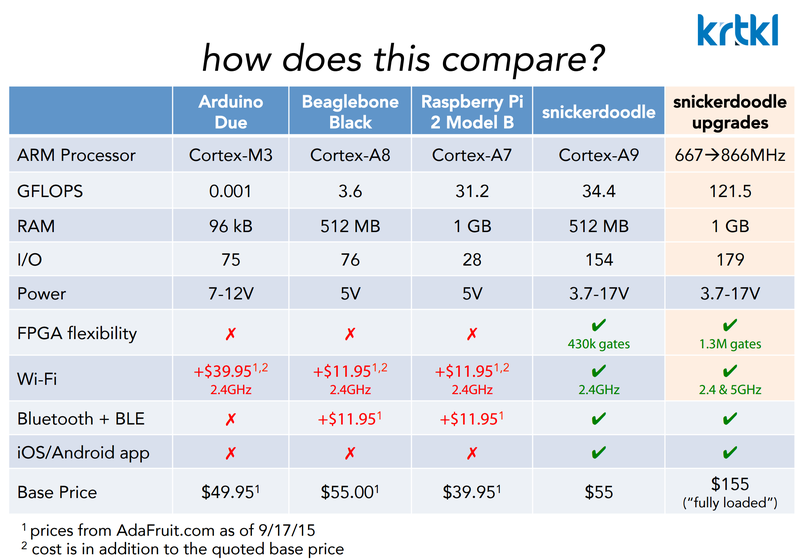 Why this matters: While the Raspberry Pi has introductory mini-PCs wrapped up, the Snickerdoodle appears ready to continue in its footsteps with a maker-focused board that’s both affordable and thoroughly obsessed with eliminating some of the biggest headaches associated with more ambitious maker projects—namely, high board prices, restricted physical interface options, and infuriatingly complex user setups. Whereas the Raspberry Pi 2 offers a mere 28 GPIO across 40 pins in a set configuration, the Snickerdoodle offers a whopping 154 GPIO across 230 pins, and 100 of those are user-configurable due to the inclusion of a field-programmable gate array (FPGA) integrated into its 667MHz dual-Core ARM Cortex-A9 processor. In other words, the Snickerdoodle lets you connect many more sensors than the Raspberry Pi, and you can make them do whatever you want and adapt to the project you’re working on, in stark contrast to the Pi’s locked-down pin configuration. The flexible, abundant GPIO options makes the Snickerdoodle better suited for more complicated tasks that the Raspberry Pi simply can’t handle, like advanced drone, robot, and computer vision tasks. You can even use Snickerdoodle to create self-navigating robots and 3D printers, according to Krktl. Wait, aren’t FPGAs complicated and confusing? They certainly can be. But Snickerdoodle plans to make FPGA and pin configuration a breeze with the help of a companion mobile app, which connects to the board using its other notable Pi-beating feature: integrated 2.4GHz Wi-Fi and Bluetooth 4.0 LE, which should also help your maker projects talk to the world. 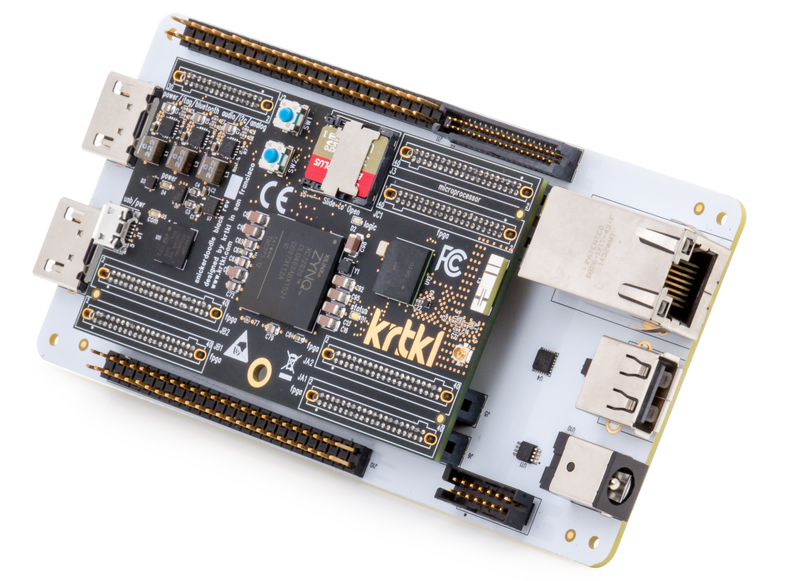 Between the wireless connectivity and the app, krtkl CEO Ryan Cousins says getting the Snickerdoodle up and running is far faster and smoother than setting up typical GPIO-laden boards. 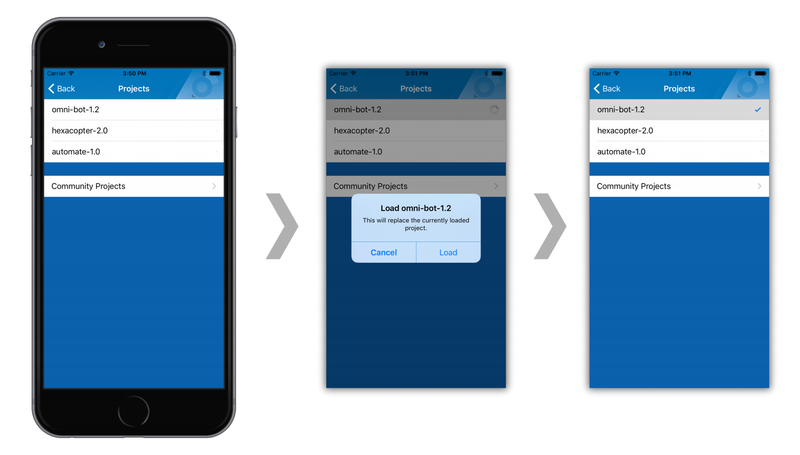 There will even be an in-app Projects menu that lets you quickly load various public community projects with no manual configuration. 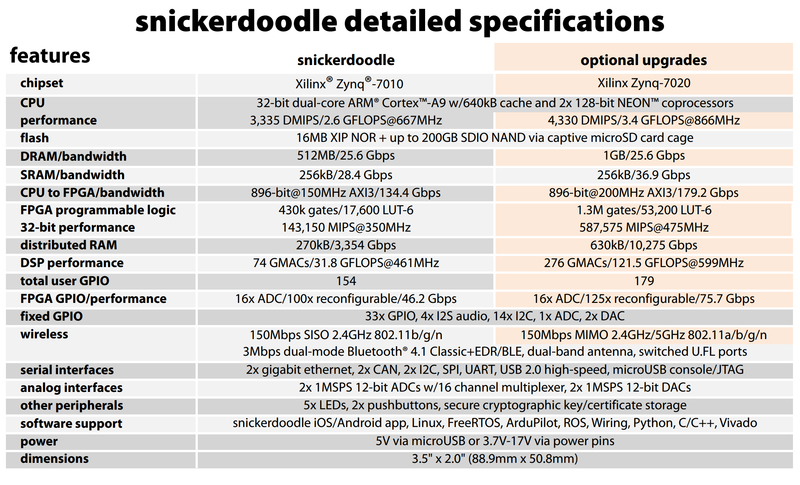 As for the hardware itself, here’s how both the base configuration and the fully loaded version of the Snickerdoodle stack up against the notable competition. 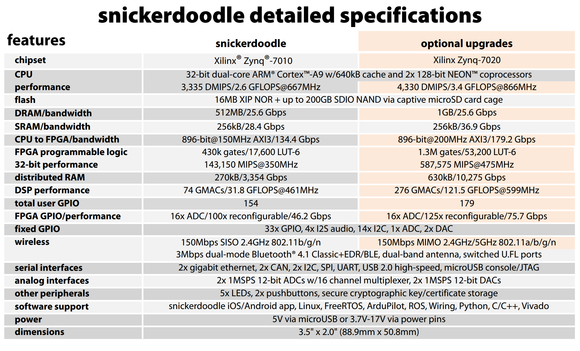 Although it’s not mentioned in the krtkl-supplied slide, the Snickerdoodle also comes with an SD card port and USB power, as this full spec sheet shows. 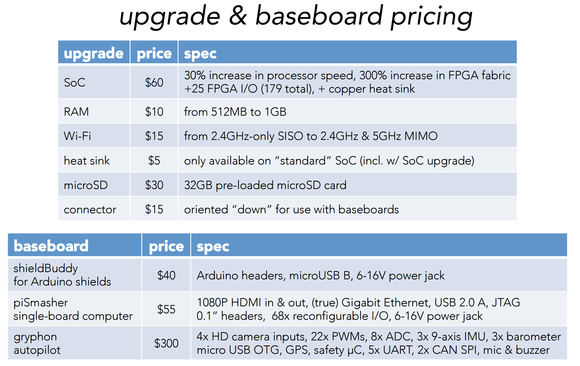 Note that “fully loaded” tidbit: Although the base version of Snickerdoodle will sell for $55 during krtkl’s Crowd Supply crowdfunding campaign, you’ll also have the option of upgrading the board with enhanced capabilities. When I asked Cousins if that could cause manufacturing problems, he said Krtkl made sure to source the base and upgrade components from the same supplier—the same CPU manufacturer is supplying both the base and upgrade processors, the same memory maker is supplier both RAM configurations, and so on. So the complexities of adding multiple Snickerdoodle SKUs aren’t as complex as they seem, Cousins says. There will be an adapter that connects Arduino shields to the Snickerdoodle and adds Arduino headers and micro-USB; a “Pi Smasher” baseboard that adds HDMI in and out, Gigabit ethernet, USB 2.0, and 68 additional configurable GPIO pins; and a pricey Gryphon Autopilot baseboard that has everything you need to get a DIY drone up and running. The Snickerdoodle mounted inside the Pi Smasher baseboard accessory. Intrigued? Krktl’s running a $55,000 crowdfunding campaign for the Snickerdoodle on Crowd Supply. Assuming the Snickerdoodle’s maker siren song appeals to roughly 1000 backers, the board is slated to start shipping next spring—though Cousins says Krtkl plans to embrace the maker ethos by releasing the Snickerdoodle’s board schematics at some point during the campaign. 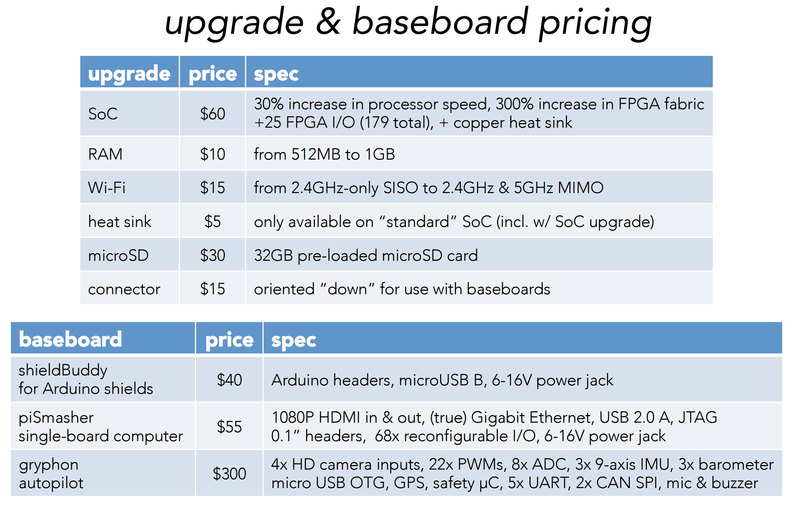 Editor's note: This article has been updated to clarify GPIO pin configurations, and to reflect the changed price of the "connector down" option for the Snickerdoodle.